Tossing and Turning All Night Long? Not Anymore! I know how it feels when bedtime starts to loom. You dread the idea of getting on to that mattress because you know you’re going to spend the next hour (or three) tossing and turning. Once you do get off to sleep, you’re constantly waking up during the night because that neck or back “niggle” you have is bothering you. This was me a few months ago and I have to say, life has changed since I bought the DynastyMattress Therapeutic Deluxe. I’m not a clinical sufferer of back or neck pain, but it was enough to keep me awake at night and this mattress has done wonders. However, just because I decided to invest in one it doesn’t mean it’s going to be the right choice for you. But, I had to include it on my website because I’m so pleased with it. Below you will find some slightly subjective information that will help you decide if this memory foam mattress is the answer you’ve been looking for. Let’s start with what you get with this memory foam mattress. It has its own AirFlow cool system (as the name suggests) which helps to stop you from becoming too hot overnight, and it’s made from 100% Visco-Elastic foam which is anti-allergy and anti-mite protected. It comes with a velour feel fabric cover which zips 4 ways, making it easy to remove for washing. When you first receive this mattress it will be vacuum packed, and it does need a good 4 or 5 hours so it can expand to its normal shape. Plus you may find there is a slight chemical odor (due to the AirFlow system included) so factor this into account if you want to use it right away. In fact, I recommend that you let the mattress “air” for at least 72 hours before you use it. For those of you that have never had a memory foam mattress before, and you’ve been sleeping on a spring based mattress instead, this one may take some getting used to. You see spring beds do exactly that – spring. When you first start sleeping on this one, don’t expect it to immediately conform to your shape. I moved from a spring to a memory foam mattress, and I have to say I found it a little strange in the beginning, but once you get used to the idea that your shape is being supported by the memory foam technology and not springs, the difference is amazing. I soon found that my general aches and pains were not as bad first thing in the morning, and throughout the day they didn’t bother me at all. The best thing of all is that I was at last able to sleep on my back which is something I hadn’t been able to do for some time. Plus, I have far less tossing and turning. Getting off to sleep and staying that way is also a pleasure I have re-discovered. What I will say though is this mattress is pretty firm, but that’s the way I like it. However, if you do have back or neck problems that require medication, I would advise you speak to your doctor before you make a purchase. Whilst this foam memory mattress isn’t exactly at the top end of the market, neither is the price tag and that was one reason why I decided to buy one. The manufacturer has also added an excellent extra that comes for free and that’s TWO matching memory foam pillows (which I almost love more than the mattress itself!). The mattress also comes in various sizes to suit any type of build. This one is the queen size, but you can also purchase them in twin, full, king, California king and Full XL which makes this particular model really versatile. 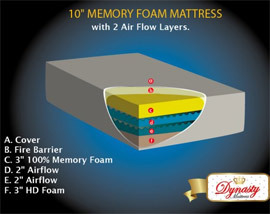 Dynasty Mattress also offers a CertiPur-US certification with a 120 day trial period AND a 20 year warranty. If you too would like to finally stop tossing and turning all night, then I suggest you take a look at Amazon (which is where I bought mine). At the time, they were offering almost 50% discount on the list price so in my humble opinion, I got a great bargain!